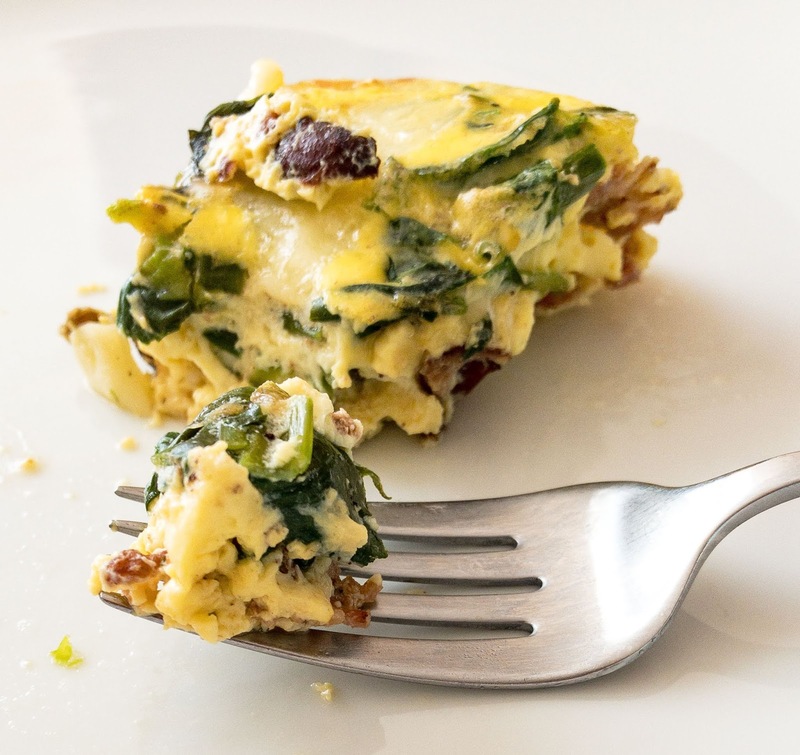 "A quiche is basically a frittata poured into a pastry shell." ... or not. Today we enjoyed a crustless version so, by definition, did that make it a frittata instead of a quiche? I don't know, don't really care, since the quiche pan held a deliciously loaded custardy something we both enjoyed. Filled with bacon, swiss cheese, spinach and green onions, it was a well-received taste treat. 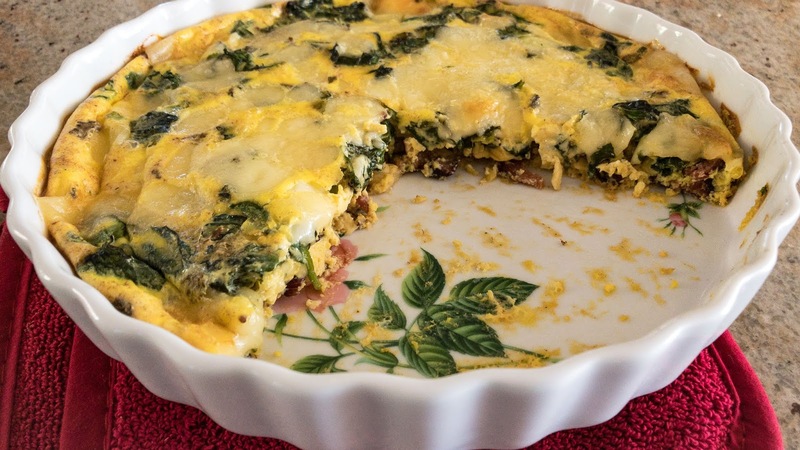 Who says real men don't eat quiche? RL loved it. Quiche Lorraine was the darling of the menu for ladies-who-lunched in the 60's; a light but rich, sparsely filled, one crust custardlike pie. Over time I recall it morphing into a dense, custardy casserole filled with unusual ingredients and baked in a soggy crust. Not an improvement. Thus my preference for crustless quiches, or it might be my utter lack of the pie-crust baking gene. 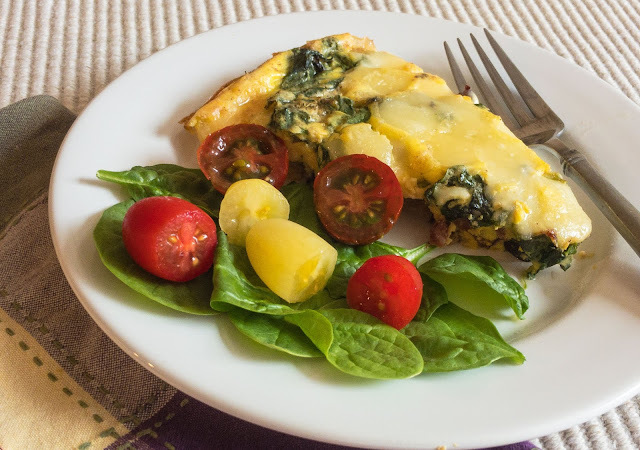 We enjoyed half of this quiche/frittata served warm at lunch, and some remaining wedges served chilled the next day. Maybe next time I'll play with a pie crust... or not. Prehea the oven to 375 degrees F.
Use a large skillet and cook the bacon until done, but not super crispy. Use a slotted spoon to remove the cooked bacon to an 8 or 9-inch quiche pan. Remove all but 1 Tablespoon of bacon fat from the skillet. Add the onions and spinach to the skillet and heat until wilted. Layer evenly on top of the cooked bacon. 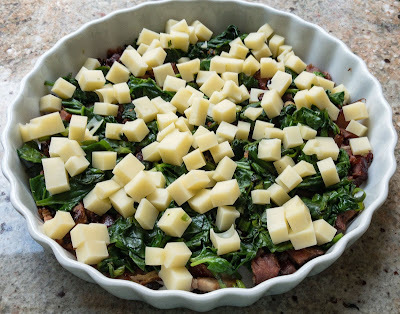 Sprinkle the cheese evenly over the top of the spinach. Whisk together the eggs, dairy, & seasonings. Carefully pour the egg mixture over the layered fillings. Place in the center of the preheated oven. Bake at 375 F for 20 minutes. Reduce the heat to 325 and cook 15 to 20 minutes longer or until the center is just set. 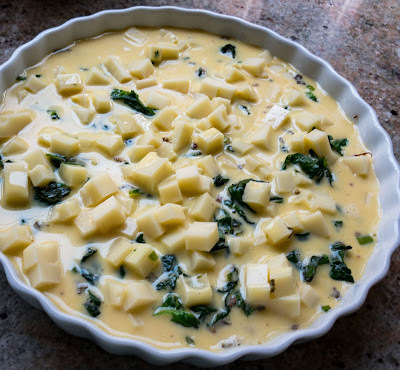 Remove from the oven, let cool for several minutes to firm up; cut and serve warm.